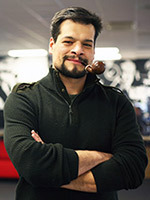 Sykes founded Smokingpipes.com in 2000, while completing his undergraduate degree in history at Vanderbilt University. Some might today assume, like Athena was said to have sprung whole from the head of Zeus, that Sykes sprang wholly prepared upon the world of pipes. The truth, however, is that he didn't have any idea what he was getting into. Mostly. He had not then ever written a line of code, and he had no inkling as to how to run a business, even one that was just two guys and a small rented warehouse space in Tennessee. What he did have from his part-time job at a local tobacco shop was an inkling of the sort that in hindsight others would call insight: technology, particularly the World Wide Web, could revolutionize pipe and tobacco retail just as it was transforming so many other industries. Of equal importance was Sykes's growing interest in pipes as works of functional art that deserved critical discussion. This interest was good enough to get things started; the knowledge needed to run a successful business would develop over time as it does for most of us in our 20s: by doing with enthusiasm. So it was with enthusiasm and two convictions--that the pipe business needed technology and that pipes were serious and beautiful things--that Sykes laid the foundation for what Smokingpipes.com would eventually become. This trinity still largely defines his role in the company today where his primary responsibilities include overseeing finances, operations, and software development, as well as vendor relationships and sales, all things that he has learned a little about in the ensuing years. But even as time has carried on and the company has grown, Sykes is still never more passionate than when working directly with, or teaching others about, pipes.